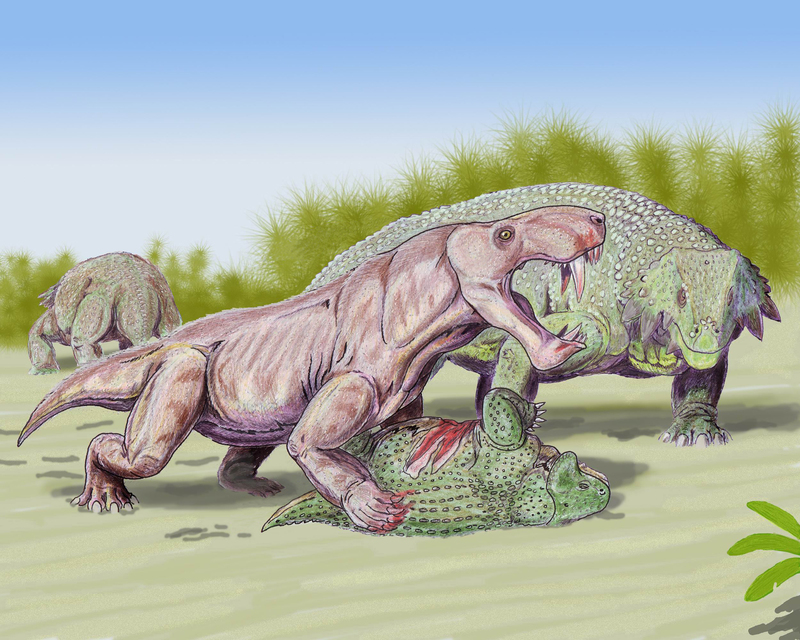 This post is the third installment in a multi-part series on the evolution of mammal-like reptiles. Time has turned it to rock, but despite the passage of so many millions of years, the head of a gorgonopsid still retains an aura of unspeakable ferocity. Gorgonopsia is a suborder of predaceous therapsids (“mammal-like reptiles”) that arose during the Middle Permian. For much of their early evolutionary history, gorgonopsians were rare, modest-sized carnivores, eclipsed in numbers and ecological relevance by thick-skulled, meat-eating Dinocephalians. The (rather unexplained) demise of the Dinocephalians at the end of the Middle Permian threw open new predatory niches for these “gorgon-faced” hunters to exploit. The most striking feature of the gorgonopsid skull is the presence of two enlarged canines – reminiscent of the dagger-like fangs of sabre-toothed cats from the far more recent Pleistocene epoch – that hang menacingly from the upper jaw. The lower canines were also massive -often only a third shorter than their upper counterparts. To sufficiently clear the canines before delivering a lethal bite, these animals must have been capable of drawing back their lower jaws far enough to produce gape angles in excess of 90 degrees. Kemp’s (1969) functional analysis suggests that Gorgonopsid jaws were capable of performing two kinds of bites: (1) a killing bite in which the animal would use its fearsome canines as stabbing devices, piercing through hide and flesh to disable its prey. The front end of the lower jaw bears a large, massy “chin” that may have served as the mechanical equivalent of a war-club, packing an extra kinetic “punch” when the jaws were drawn shut. (2) a more surgical type of bite in which the incisors interlocked when the jaws were closed, allowing the animal to slice out a jagged edged hunk of flesh from a carcass. The transtion from biting mechanism (1) to (2) was made possible by the movement of the lower jaw to a more forwardly position so that the serrated incisors could intermesh. The large size of the snout indicates that smell was key to the hunting behavior of these ancient predators. Compared to pelycosaurs like Dimetrodon, Gorgonopsids have rather gracile post-cranial skeletons with limbs that are longer and more vertically oriented. There was probably less lateral swaying of the trunk during locomotion and the back was kept straighter. The tail was smaller. The body was held well clear off the ground and some skeletal reconstructions of Gorgonopsids even evoke a sense of wolf-like nimbleness. According to some workers, the nature of the articulation between the femur and the acetabular socket of the pelvis suggests that the gorgonopsid hindlimb was capable of switching between a primitive splayed posture and a more erect mammalian stance (similar to the “high walk” of a crocodile). The precise character of limb suspension in Gorgonopsids – which probably lay somewhere in the gray-zone between ‘sprawling’ and ‘fully erect’ – is still debated. The hind-limbs (which accounted for the bulk of the animal’s speed and propulsive power) were more upright than the fore-limbs. While body form did not vary considerably among different gorgonopsid genera, there was certainly a range in size . The smallest known gorgonopsids are comparable in body dimensions to modern day canids. The largest gorgonopsids (members of the genus Inostrancevia, for example) measured around 3.5 meters from nose-tip to tail-end, making them longer than any living land carnivore. These late Permian super-predators were well-adapted for hunting huge, stocky, slow-moving, plant-eating dicynodonts and paraeiasaurs. In some ways, this mode of life was replicated in a much later era by saber-toothed cats that preyed heavily on herbivorous megafauna. It is worth listing some of the other important features gorgonopsids bear in relation to the pelycosaur-to-mammal transition (the ‘advanced’ traits are italicised and the ‘primitive’ pelycosaur-ish traits are indicated in normal font) – (1) a secondary palate is absent, (2) the dentary of the lower jaw is expanded, (3) the stapes is reduced, (4) cervical and lumbar ribs are present, (5) they display the same advanced bone histology seen in Dinocephalians, (6) no definite statements on the presence or absence of body hair in gorgonopsids can be made. There is, however, a limited amount of evidence indicating that their snouts may have borne vibrissae or whiskers, (7) the relative size and shape of the brain had not changed significantly from the pelycosaur condition. The gorgonopsids were wiped out by the end Permian extinction event. After their disappearance, new non-therapsid animals would come to take on the mantle of terrestrial super-predator – among them, Raiusuchians and Theropod dinosaurs. 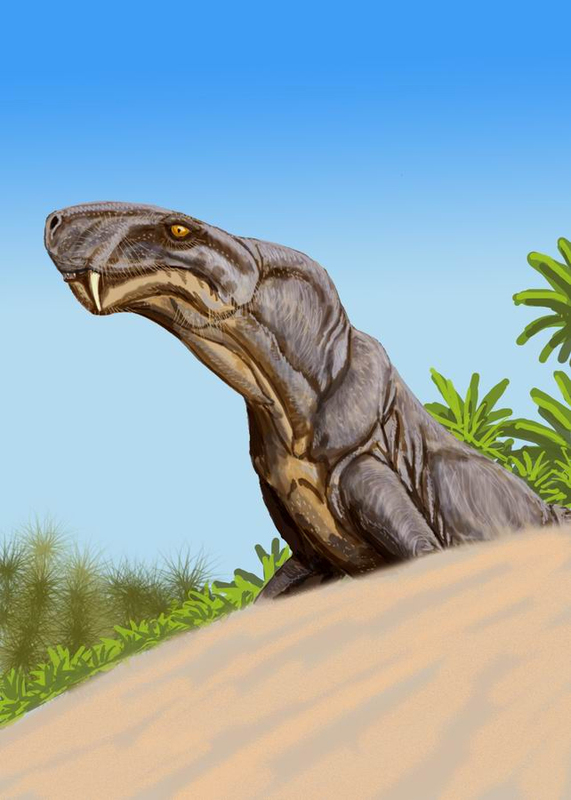 In the next post in this series, we’ll spend some time on two more Therapsid groups: the Dicynodonts and the Therocephalians. 1. Kemp, Thomas Stainforth. “On the functional morphology of the gorgonopsid skull.” Philosophical Transactions of the Royal Society of London. Series B, Biological Sciences (1969): 1-83. 2. Kemp, Thomas Stainforth. The origin and evolution of mammals. Oxford: Oxford University Press, 2005. 3. Kemp, Thomas Stainforth, and T. S. Kemp. Mammal-like reptiles and the origin of mammals. London: Academic Press, 1982. 4. Chinsamy-Turan, Anusuya, ed. Forerunners of Mammals: Radiation• Histology• Biology. Indiana University Press, 2011. 6. Van Valkenburgh, B. L. A. I. R. E., and I. Jenkins. “Evolutionary patterns in the history of Permo-Triassic and Cenozoic synapsid predators.” Paleontological Society Papers 8 (2002): 267-288.
as always – great post! I think gorgonopsians like Inostrancevia and Rubridgidea(spelling?) are truly noble beasts. I am honored to consider them my distant evolutionary cousins. They and all therapsida deserve much more science bookshelf space than they currently occupy. Kudos to Dr’s.Benton, Ward, Erwin, the author of this wonderful bloog Arvind and others who make the Permian Period world come alive through their writings. Thanks for your kind and informative comments, Rich. I appreciate them! My brother suggested I would possibly like this website. He was once entirely right. This put up actually made my day. You can not imagine simply how so much time I had spent for this information! Thank you! I am now not positive where you’re getting your information, but great topic. I needs to spend a while learning more or figuring out more. Thanks for wonderful info I used to be searching for this info for my mission. language is a critical knowledge management practice. will be more and more people will choose this video converter. site known as lenses related to any subject8. that I extremely enjoyed the standard info a person supply in your guests? This article has inspired me to continue to focus on my own blog! thing like that before. So wonderful to discover someone with original thoughts on this subject matter. If you wish for to increase your familiarity only keep visiting this web site and be updated with the newest news update posted here. ALl of these need much more fur.